Keep in mind that these principles can apply to any engine. Some areas of this information may not fully agree with your Engine Repair textbook, it is your responsibility to locate those differences and bring them up during classroom discussions. the Straight Shot port and the High Approach port. In a Straight Shot port, the design allows for a line of sight from the inlet directly to the front opening of the intake valve. Sometimes this design gives a lower flow value but because it is straight, we attain higher velocity of fuel/air entering chamber. 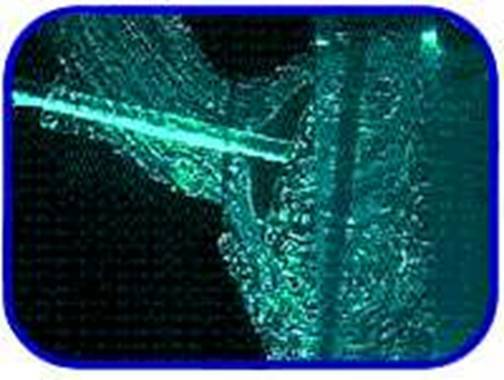 It also creates a turbulent spin or swirling in the combustion chamber, yielding a more efficient and more complete burn. A High Approach port is where a turn is necessary in the port design. The term "high approach" comes from angle of the last section of the port relative to the valve - it is more in-line with the valve stem. We take advantage of this to get a full volume flow path in the complete 360° circumference of the valve. Making a turn to an airflow is problematic but we caress the turn - making it as moderate and efficient as possible - to use it in our favor. The straight shot into the opening yields a fuller, more uniform flow around the entire valve curtain. The advantage is that the complete valve opening is used more completely. 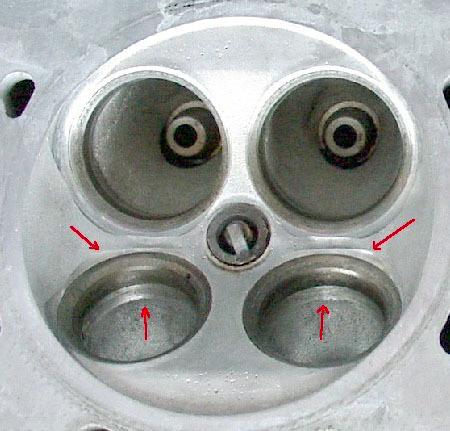 Remember that the pre-requisite of the flow arriving at the valve seat should be that the flow velocity at any rpm maintains atomization of the fuel (fuel remains suspended as a mist in the air and does not "rain out" in big droplets onto the cylinder head wall).The flow in the intake port should not separate and form vortexes before it turns down into the combustion chamber. When flow in a duct (an intake port, for example) arrives at a bend, it loses any semblance of orderly behavior. Particles on the inside of the bend travel the shortest distance (offering the least resistance to flow), so they tend to maintain speed in the downward turn to the valve seat. But flow in the top of the port slows relative to the floor, creating a large velocity gradient. Pressure in a moving fluid varies inversely with it's speed, so the velocity gradient creates a lower pressure at the port floor than at it's roof. This differential causes air at the sides to move upward and the midstream air to move down, with the resulting flow stream made to divide into to contrarotating vortices where the port bends. Add to this the invisible "smoke ring" vortex forming beneath the opening intake valve and you have enough disorder to confound even the best of minds (or computers). Port and valve configuration (both shapes and angles) can profoundly influence combustion efficiency as well. Jack Williams' AJS 7R made it's best power with an intake port shape that compromised flow in favor of creating more combustion chamber swirl and redirecting incoming fuel droplets away from the cylinder walls. I am reliably informed that Keith Duckworth has settled on the intake valves leaned 15 degrees from the cylinder axis, and ports at 30 degrees from the valves in a similar trade-off between flow and combustion. Intake flow influences combustion because both carburetors, and fuel-injection nozzles deliver fuel in liquid form. The best you can hope for is a fog of droplets small enough to stay suspended in the air while evaporating; big drops are centrifuged out of the air stream, splatting against the intake port and cylinder walls, which is bad for power, fuel efficiency and emissions. Fuel can't burn until it evaporates; if you have raw fuel still trying to burn when the exhaust valve opens, it goes out the pipe, wasting your money and polluting the air. Tapered ports and valve seats aim to re-accelerate the air-fuel mix like a venturi effect, after it has slowed down and made the turn down the bend to the throat. However, there is more to it than that. Here is what the stock valve seat angles recommend. Honda uses the 30-45-60 degrees discreet angles configuration for their valve seats in their performance-oriented cylinder heads, as seen in the GSR, ITR, and CTR. They are called "discreet" because they stand out on their own with distinct sharp edges or borders and are not blended smooth into each other like radiused seat angles seen in domestic heads. It's important to cut the 45 degree angle valve seat surface location precisely (using dye to mark if the seat sits properly). On the cylinder head, the 30 degree is closest to the piston or combustion chamber side and is called the "top cut". Next is the "seat angle" proper which matches up to the valveface's 45 degree seat angle. The 60 degree angle below the seat angle is closer to the intake port/IM and is called the "throat cut". Figure 2. Traditional Target Areas for Material to be Removed by Headporting (lighter shaded parts): Roof around valve guide, Floor's short turn radius, and valve seat. The area from the exposed area of the valve guide down to the short turn radius or port floor is called in headporting terms the port's "bowl area". Figure 3. Reducing the lowest valveface angle (called "backcutting" the valve) and the altering the head's throat cut & seat angle to modify the "flow cone" shape at the low-mid valve lifts are where the major gains on a 3-angle valve job are made. Narrowing the seat angle's width also improves low lift flow. Top cut alterations and bowl blending improves mid-high valve lift flow. (A) In this production intake port, air starts into the port flowing smoothly. When it encounters the factory casting flaw on the floor of the port, smooth flow breaks into tumbling and turbulence. This causes restriction to the overall airflow in the port. (B) The turbulence in the airflow becomes more severe as air passes the sharp edges of the short side radius in this drawing. Smoothing the radius and removing (certain) casting bumps and flaws (not all of them) reduces turbulence and increases flow. C. Why the Valve Seat? Figure 5. 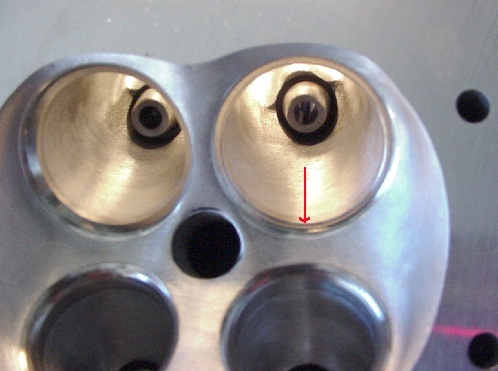 Casting Flaws (indicated by the 4 red arrows) below the valve seat and the ridge above the valve seats in the combustion chamber are typically smoothed out to allow for a more homogeneous flow to get swirl filling (of the air-fuel mix) into the cylinder. Some suggest that the "underhangs" below the valve seat (bottom 2 red arrows) should be left alone, since they help create swirl as the intake valve opens (from Endyn's B16A head porting article). Most headporters would agree that the prime "bang for the buck" area to gain performance from Honda headporting is at the valve seat angles and in the transition from the port's bowl area into the valve seat. This is where Honda focused it's attention on the venerable b16a head to turn it into the impressively improved b18c5 (type R) head. This fact may surprise the novice who may have thought that the port entrance (mating to the IM) would be the main area for performance improvement. 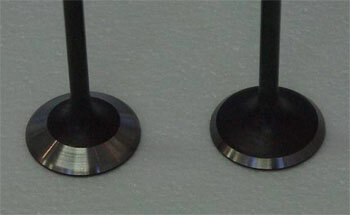 The goal of the flow at low rpms in DOHC layouts, as it passes by an opening intake valve seat, is to have swirl filling or reverse tumbling or a combination of these 2 cylinder filling methods rather than just a conventional tumble cylinder filling that the overhead valve layouts prefer. In this way we achieve layers (called a stratified charge) of air:fuel ratios which become progressively leaner and leaner towards the bottom of the cylinder. This stack of air:fuel layers with different air:fuel ratios (leanest at the bottom by as much as 28:1 air fuel ratio) is the basis of a compact combustion chamber's lean burn theory. It allows for better gas mileage, emissions, and of course, power by combusting or burning more rapidly (and more completely) than just the tumble fill of large combustion chambers (in old domestic V8's), when the air flow speed is low. At mid to higher rpms, swirl-tumble filling with higher air flow speeds achieves a homogeneous intake charge to achieve an efficient complete burn when there is less time for the combustion stroke event. The valve seat angles are critical in achieving swirl-tumble fill and prevent reversion (reverse flow back up the intake port throat). Check out the .avi files of Swirl Filling Versus Tumble Filling! D. What Do We Change? There are differences in opinion as to whether all the areas shown in Figure 2 need to be removed by a grinder on a Honda cylinder head. Traditionally, most domestic porters go after casting flaws in the port and sharp protruding corners on the port roof around the valve guides and short turn radius on the floor or the port. However, some would suggest that removing even some casting flaws like the underhangs or indentations just below the valve seat, the roof area, and tapering valve stems gain little in the way of improving ( and may even hinder) swirl filling. In fact, removing some of these casting flaws on a Honda head may hurt flow as discussed above! Some have found that undercutting (i.e. tapering) the valve stem doesn't make more power by increased flow quality in the already very efficient Honda B series heads (in the Integras). The main reason for narrowing the stem is for valvetrain weight reduction NOT flow improvement. In contrast, undercutting the valve stems does benefit a Honda D series head. The bottomline is to be careful not to assume that what is good for one engine's head is necessarily also good for another engine's head. Figure 7. 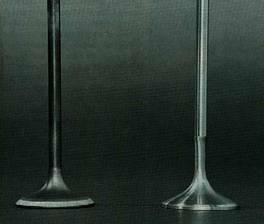 Controversial: Do We Gain Much With Tapered Valve Stems in a B18C? : Stock B18C Valve Stem on the left and DPR Tuliped Stainless Steel Valve with Undercut or Tapered Stem. The main yield in additional power from better flow comes from the valve seat itself (on the head) and on the valveface's seat angle and back cut angle. The head's second discreet concentric step (called the "seat angle" proper) can be cut to 45 degrees and the next concentric angle below this cut (called the "throat cut" , see Figure 3.) 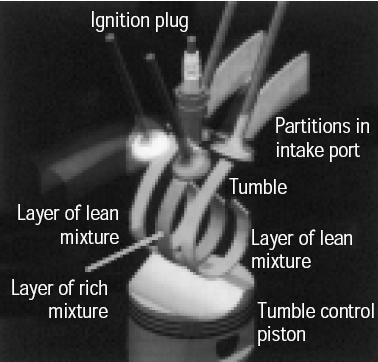 can be changed to produce a sharp "step" which reduces reversion (backwards flow) on the compression stroke, when the intake valve is beginning to close and the piston is squeezing the air-fuel mix or during cam overlap when the intake valve is starting to open at the start of the intake stroke when the exhaust port & chamber pressures are higher than the intake port pressure. How steep one should go and the specific angles below the second 45 degree concentric angle is, of course, proprietary for each headporting shop and each application (FI vs. N/A). The factory chose to reduce the GSR and Type R head's second concentric valve angle (i.e. seat angle) already from 60 degrees, in previous 2nd generation Integras, to 45 degrees. Some shops reduce this second concentric seat angle even further to 40 degrees on the intake side while assuring that the concentric angles above & below prevent backward flow. Do NOT lap the valves, period, if you want the seats and valve faces to last any length of time. * Note to students: See supporting text and make your own conclusions. I haven't lapped a valve or seat since the late sixties. Lapping compound imbeds itself in the face of the valve and in the seats, causing premature erosion of both. I've wondered since day one why all the import head experts lap valves, but I've always attributed it to lack of experience. I'm not aware of any professional head shops that do domestic heads that lap valves either, but domestic head people have a lot more years of experience too. Lapping valves is a great way to insure that the valve job won't last any length of time. Honda doesn't recommend doing anything to seats (and valves) other than machining them too. I can also tell you that there are a LOT of stainless valves out there for imports that are junk because they're so soft. It doesn't take much use before they end up with the valve seat angle "pounded" into their faces, effectively ruining both the seal and flow capability. The bottom line is that you NEVER lap a valve, or a seat. If the seat's machined concentrically, and the face of the valve has lass than .0005" runout, the engine will seal up. 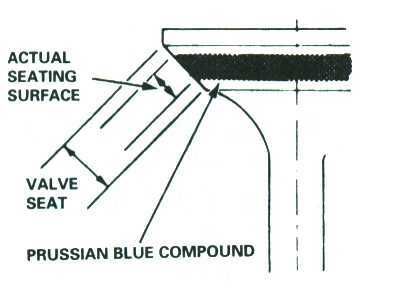 If you need to "see" where the seat is contacting the valve face, use some machinist's (Prussian) blue on the face of the valve and spin it against the seat with a lapping stick. The contact area will be "cleaned", showing the width of the seat. We soak valves in a solvent and then use a soft wire wheel on a bench grinder to remove carbon deposits. Next the valves go to the Serdi centerless valve grinder for facing. After the faces are in mint condition, we "adjust" their widths by grinding a back-angle on the valve. I narrow the face so it's about .015" wider than the valve seat, with .003" on the outside and .012" on the inside to allow for valve head expansion when hot. Figure 9. Adding an antireversion step below the seat angle (throat cut and below) yields significant gains in power according to Endyn, despite the fact that it also prevents any forward low valve lift flow below 30% net lift. If I'm reading it correctly, you want to know what the lower angles should be and where the anti-reversion step is located?? First, if I was doing a multi-step valve seat, the angle under the seat proper might not be 60 degrees......surprise! On the short side, that angle may be 55 degrees (or less) with a width of say .045", however, on the long side, that same angle may only be .010" in width. The angles under this may be anywhere from 60 degrees to 90 degrees, depending on the flow characteristics we are trying to achieve with the port. I suppose what I'm saying is that there are no "set" angles that are representative of the way our valve jobs are configured. If I was doing it all by hand and starting out with a 3-angle valve job (on a Honda), those angles would be 35, 45, 55 for both intake and exhaust seats, but by the time I'm done blending them into the variable radii necessary, you'd never be able to measure any of the angles except for the seat proper at 45 (in this example). If I were to machine the anti-reversion step into the intake, it would fall in the 55 degree angle and there's be a 90 degree drop of approximately .020" followed by a 65 degree angle transitioning back into the existing valve job. ...at what net valve lifts do you see intake reversion on the compression stroke and intake stroke respectively? Study the intake valve lift curve in it's early stages of opening (while the exhaust valve's off it's seat) and that will give you a fair idea of when reversion will occur. There's another reversion spike created when the intake valve closes on it's seat and the mixture "rebounds". Endyn's Comments On "the Big Steep Step"
Ports flow in both directions !!! During overlap and at the point of intake valve closure the flow spikes back up the intake port. Now, since the reversion during overlap is basically inert you can't burn it again, and any time there's a large pressure spike (from valve closure), the mixture that was headed to the port via inertia is adversely effected to say the least. My fix for this dilemma is the design of the intake valve seat. The configuration of the intake valve seat and the valve itself can minimize, if not stop the reverse flow problem. A large intake valve or an intake port that flows great at mid to high lift, doesn' t have low lift flow worth a damned if I designed it. During my attempts to discourage reverse flow on the inlet, I found that any port that flows well at lower lifts will flow backward with even greater efficiency. So attention to seat configuration kills low lift flow, in order to discourage reverse flow. If I could design a port / seat configuration that would flow "0 cfm" at low lift I'd be happy. The best way to kill reversion on the intake valve is to simply put a 90 degree angle on the side of the valve head (flat with sharp edge margin to chamber side). We've never seen any worthwhile results from trenching the chamber side of the intake valve. Valve shapes were the first place most of us began looking for reduction in reverse flow. 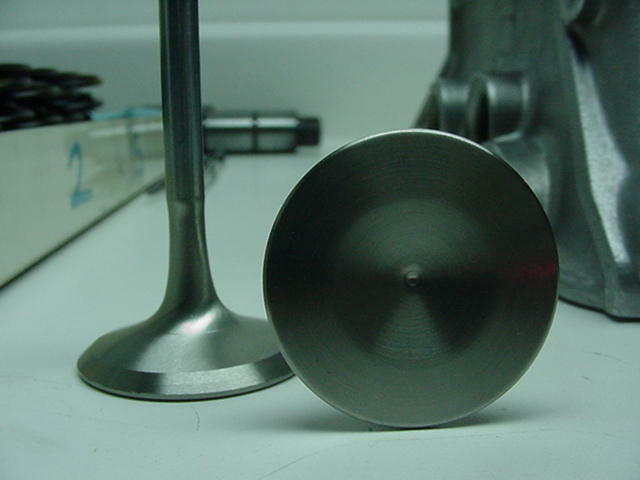 Intake valves like to have "square" edges...with the corner defining the break from the chamber side of the head to the margin being 90 degrees (or less) with a sharp edge (no radius) and the corner defining the break from the margin to the face angle being equally sharp. 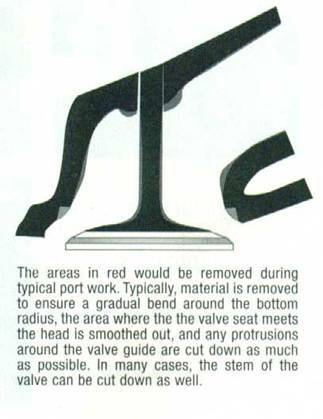 If the seat is a pure radius, the valve would have to have a (matching) convex radius to seal with the seat, assuming there was to be more than (point) contact between the two components. The convex radius in the valve face wouldn't be conducive to efficient mixture flow. On the mechanical side....since the seat and the valve don't expand equally with temperature, the two designated radiuses wouldn't even match each other during thermal cycling. While simple stepped angle cuts do create some turbulence, they do provide a "simulated" radius of sorts and they also permit a positive seal with the face angle of the valve itself. Exhaust valves like radiused corners for positive flow and reversion also likes the shapes. If we haven't stopped reversion prior to the valve, we will trench cut the valve, so there's a sharp step connecting the tulip (or filet) to the actual seated face of the valve. It's very effective. The intake port throat should expand in area slightly during the short turn radius section (regardless of height) to lower velocities and increase pressure providing the necessary energy to enhance the mixture transition through the seat region and on into the cylinder. The intake valve seat should be configured using a single discrete seat angle with the combustion chamber defining the OD and the ID should be established with a short (.010") 58 degree bottom angle. The configuration of the remaining lower shapes intersecting the port should be designed to create a longer short turn "roll" and a steep side and back wall approach to the seat, so the inner angle blends to shapes which are not concentric with the seat. This is all in an effort to create equal roof and floor lengths. One added benefit of this seat configuration is that it does not invite reverse flow, and subsequent power losses. While we're discussing valve jobs, some additional thoughts need to be outlined regarding the configuration of valve seats. I consider the valve seat to be the single most important aspect of intake port preparation. It's absolutely essential that machining tolerances be held to .0001". The individual valve stems should be externally honed to a proper finish and each valve guide should be honed to fit the valve selected. When finished, each valve will have it's own numbered guide. As the tolerances of the valve to guide clearance will be extremely tight, the run-out tolerance of the seat should also held to .0001". When preparing to machine valve seats, we place a fixture on the cam side of the head with springs loading the upper portions seat buckets. Sparkplugs are torqued in place, and we always use a torque plate / head gasket bolted to the head's deck. The last bit of effort to simulate the real world is to pump 220 degree coolant through the water jacketing of the head while all seat machining takes place. These steps may seem to be excessive, but if they weren't necessary, we wouldn't do them. All seat machining is also based on centerless-ground pilots which are a "no taper" fit in each guide. We also feel that all adjustable pilots should be discarded as trash and any "reputable" machine shop should feel the same way. Now, back to the port. The port itself should be configured to work with the chamber and cylinder wall to create a flow bias that will tend to cause rotation of the mixture in the cylinder, which we now call swirl. The studies and tests all indicate that it's indeed possible to design ports and surrounding areas in the cylinder to allow optimal swirl frequency at almost all RPM ranges. Let me start by saying that the valve seat configuration isn't as great an influence on swirl or tumble as you might think. The classic 30-45-60 degree valve seat offers good sealing and good overall flow performance at low, mid and high valve lifts (by Honda standards). The stepped angles are simple to machine and since the flow is only stepped by 15 degree increments, mixture separation isn't too severe. Wet flow testing on some of the "primitive" machines out there has lead many to think that the stepped discrete angles offer better mixture delivery to the cylinder than radiused configurations. This is true, but if the seat is configured with an asymetric radius and a single discrete seat angle, mixture delivery and flow rates will benefit. This sort of valve job is extremely labor intensive, and therefore expensive to do. One also has to have a real handle on the nuances of port flow to make this type seat work. ... In fact the only thing the ITR head has going for it is it's seat configuration, which is a more performance-oriented valve job, with the seat proper placed further outboard on the valve's diameter. The inside diameter of the seat is also larger than that of a stock B16 head, allowing higher flow rates necessary to feed a 1.8 liter combination. We won't even fool with porting an ITR head anymore because the people porting them have removed so much material in the "wrong" places that there's no way to salvage the head, even for large-port combinations. When we port a stock B16 head, we can get about 8% more flow in critical lift ranges over an ITR head we've reworked. The GSR head has a larger ID to the intake seat than the B16 head, which is intended to feed a 1.8 liter engine. As for the steeper port on the GSR...you have to connect the port to the intake manifold before you attempt to analyse it's flow characteristics. As short as Honda's intake ports are on their B seried VTEC heads, you run the risk of looking at a "clouded picture" on cylinder mixture motion, if you're just studying a port with a radiused entry on a flow bench. Some of you may also be shocked to know that intake valve seat angles we use in many heads are no longer 45 degree angles. 55 degree intake seats are pretty common these days, especially in instances where we're looking to improve mid-to-high lift performance. This steeper seat also works well with intrusive chambers and situations where cylinder wall proximity is a concern. it's a great way to cheat a port into thinking it has a larger diameter valve in it. ...On the all-out killer heads, our best head based on a B16 casing will outflow an equivalently prepared GSR by perhaps 5 cfm at .500 lift and that's not enough to cause one to out perform the other in the real world. The magic is the people and their tools creating the variable and concentric / non-concentric radiuses. (On the valveface,) we move the 45 degree out to within .005" of the edge of the valve(face). If you face a valve, the 45 will extend to the edge. We use back(cut) angles of varying degrees, dictated by the application the head's intended for, (in order) to narrow the 45 and allow the flow to "see" the window (into the combustion chamber) at earlier lifts. 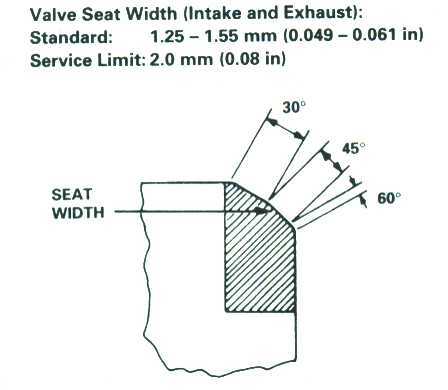 The width of an intake seat (angle) is typically .045", and the exhaust is the same (on our Honda heads). 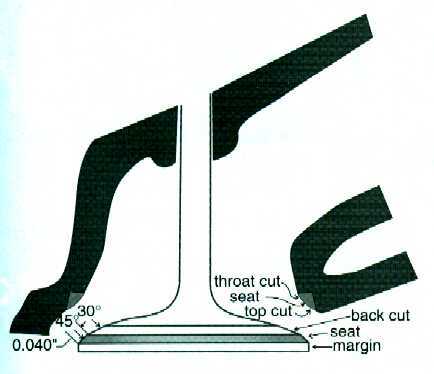 Use a blended 35 degree top (cut) angle on the exhaust, with a 53-55 degree (throat) cut below the seat. This (top cut) should be radiused into the bowl. (For 5 angle valve jobs,) intakes on these engines like a very short 33 degree top (cut)angle (.008" wide max), with a 58 degree (.010" width ) (throat cut) beneath the seat. This (throat cut) angle should be followed by a 65 degree on the short turn side and a 70 degree on the long side. All of this needs to be blended into the port's bowl to work properly. Keep in mind that the angles and port throat are all ultimately blended into very complex radiuses, with the 45 degree (seat angle) being the only discrete angle left. The seat width was dictated by the size of the valve, it's mass, and the camshaft specs, with durability a key issue. The valve seat "angles" must be constructed to permit the engine to inhale the maximum (non-separated) inlet charge , when the piston speed (and pressure drop) is greatest, if you're going to make big power. The fact that we're dealing with flow travelling in more than one direction makes the job more complex yet. Consider the fact that, aside from the positive pressure the intake sees momentarily when the valve opens on the exhaust (overlap) event, there's a secondary reverse spike to deal with when the valve returns to it's seat. The principal seat (face) angle will certainly have an effect on the flow characteristics of the port. It's width will also affect the flow rates and quality, as well as it's durability. A narrow seat transfers less heat than a wide one and it will also tend to "pound" over a period of time, changing both sealing capabilities and flow characteristics. Therefore, the seat's width should be based on flow, valve and seat materials, camshaft and springs, rpm range, and the engine's application. The transition from the ports to the seats should be smoothed and any humps or obvious flaws smoothed. Use a some good hard cartridge rolls (80 grit) to blend the aluminum to the seat rings in the bowls. The grinder must be turning at moderate rpm and care must be taken so the roll doesn't remove more material from the aluminum part of the port than the seat. You want to avoid a positive step on the approach to the seat (except as above, where the casting underhangs the shape). I'd use a hard 80 grit cartridge roll to blend the seats to the bowls just as with the intakes. If you're very careful and don't touch a valve seat (the 45 degree angle), you can create a radius shape to the exhaust seats. What I have noticed is that the B16 head has a different bowl shape to it. If (the bowl is)shaped correctly, you see really good high lift CFM gains. If you don’t (shape the bowl correctly), well…, lets just say you gave someone money to just make it look pretty while over looking this area. Over the years many porters and head shops say bowls are for low lift, short side for mid lift, and runner for high lift. This is where you target to change the flow characteristics at certain lifts. I am sure this applies to many heads but it just goes to show you that Honda heads are finicky where you think something shouldn’t work (then) actually works! One more thing that I have noticed is that on a lot of production multi valve heads, high ports seem to flows better in low to mid lift numbers ...while ports with a tighter radius tend to flow better at high lifts. I noticed this a lot with motorcycle heads also. They don’t lift very high. On the average they see about .300-.350 (7.6-8.9 mm) of valve lift only. A high port would work extremely well on this type of lift. The past few months I have spent a lot of time flow benching different types of valve jobs on the B16, GSR, D16 and S2000 head. I have noticed that this is one area that is taken for granted. The reason being is many "racing head shops" out there use SERDI or SUNNEN carbide inserts with a typical 30,45, 70 or 30, 45, and a radius. This is the bible to them and use them because they don't know otherwise. On the S2000 head, if you use these angles you just lost about 2-3% of flow from .050-.350 (1.3-8.9 mm) valve lift. I've even tested a 5 angles seat (this is a joke) with less than stock flow results. Angles are very important producing venturi effects essential at certain valve lifts. On old non performance factory heads the 30,45,70 may see gains only because the head is so bad to begin with. We here at ALANIZ know what works and what doesn't. On our S2000 inner workings project we have over 25 individual seat angle tests. It was very difficult to improve the factory valve job. The reason we know this is because we flow tested a brand new head with factory seat and valve angles. After all this testing we found something that really works. We saw about 2-3% improvements on the low lift and about 1% on mid to high lift numbers. Valve profiling is very important also. Matching seat angles to valve angles will result in a good breathing combination. That's why our work is second to none. Don't settle for guess work. Our flow bench testing assures us of our work. I hope I have shed some light on this subject and hope it will help you make the right decision. Use all information in this article at your own risk.